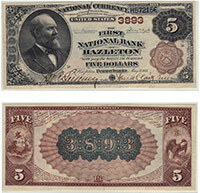 We buy all antique paper money issued by The Jacksonville National Bank of Jacksonville, IL. We can tell you how much your $5 bill is worth. We aren’t just dealers. We are also collectors, experts, and appraisers. We have contributed to numerous price guides and are considered specialists in the field of national currency. Contact us via phone or email to get your free appraisal today.